Last week I did a mind map showing all of the stories in the Chicago Tribune that illustrated how poverty leads to poor school performance, to at-risk behavior and to a greater percent of minority youth going to jail rather than college. I found 18 stories that I could connect as either illustrating the problem or a potential solution. This week I tried the same thing, but other than a couple of small reports on street violence (a shooting in Chicago that kills two gets less attention than a shooting in Iraq that kills two. Why? ), I could not find any. Yet, during the week there was a full page story about the deplorable conditions of bathrooms in some innercity Chicago schools, which certainly contributes to a lack of focus on learning. The Tribune did not even print the report on segregation released by the Chicago Urban League. The competing Chicago SunTimes devoted 2/3 of a page to this. Of course there also were stories about the Leave No Child Behind tutoring programs. What this illustrates is a lack of media strategy to use this resource to provide more consistent attention to issues of poverty. We don't see Sears/K-Mart or other retailers in and out of the Sunday paper every week. They know that if they don't keep telling potential customers that they have the products and services people want, when they want them, and at a convenient location, customers will shop some place else when they are looking for these goods or services. Tutor/Mentor programs and other non profits serving youth in poverty have the same need for weekly advertising that tells what the problem is, and ways cutomers (donors, volunteers, leaders, etc.) can find a way to help at a convenient location. It might take a stretch to define "convenient" since the poverty neighborhoods of Chicago are so large. However if we can get a potential donor or volunteer to look at a map, many can see that the work in the downtown area but live in the South, West or North suburbs. The train routes go right through the poverty neighborhoods. So do the expressways. That means that if people were to car pool they could meet downtown after work and drive to a tutor/mentor location near an expressway to tutor or mentor before going the rest of the way home. Or, a company might use T/MC maps to see that they have many business locations in inner city neighborhoods. This could lead to a strategy of providing philanthropy near where a company does business, not just in a few high profile places. Unless we can increase the number of times we put our call to involvement in front of the public, and our ability to do this more consistently, all of the money that does go into public awareness will not be doing enough. Our solution is connecting our message delivery with other non profits and with businesses, faith networks and media, and using the Internet to expand the reach and frequency of our message delivery. However, it would be great to see some consistency from media, even if only on web sites, so that every day the news leads people from bad things into a path that leads to good things. Visit the web links at the left to learn how we're doing this and ways you might get involved. Record number of ex-convicts return to streets. Two-Thirds will be rearrested within 3 years. Have you every heard of a concept called mind mapping? You take a clean sheet of paper and put a circle in the middle. Add a topic, then start brainstorming everything you know. As you think of things, draw spider lines from the circle and write down each idea. As you think of related ideas, add them as lines extending from main thought lines. Today I applied this thinking to my Sunday, June 19, Chicago Tribune. One front page article headline was "Record number of ex-convicts return to the streets." As the topic of my mind map I decided to map out all of the articles in today's Tribune that were related to this, or that were offering a strategy to keep youth from prison in the first place, or help them to meaningful jobs after prison so they would be less likely to return. I don't know how to put a graphic on my blog yet, so if you'd like me to fax you my mind map, post a comment below. I found 18 stories, including two full page advertisements, that I could relate to this topic. In addition to the front page story, which was followed by two-full inside pages and a map showing that most ex-offenders go into just a few West side and South Side neighborhoods, there were two other stories that I would call "negative news". For instance, there was a page two story titled, "Happy slap” jobs breed fear, anger" which talked about anti-social behavior associated with working-class youth in Britain’s urban centers." Prime Minster Tony Blair was quoted as saying, “It’s time to reclaim the streets for the decent majority. People are rightly fed up with street corner and shopping center thugs…” I've read similar editorials in Chicago papers over the past 12 years. There was a page 3 metro story with a headline "3 killed and 4 wounded in weekend shootings." This was not Iraq, this was inner city Chicago. That's the problem. Our solutions have been much to simplistic. I seldom see anyone holding up a chart like you can see on the http://www.tutormentorconnection.org web site, that shows a timeline from birth to a career, with elementary school, middle school, high school, college/vocational training, job, as stages that inner city kids go through. I don't see people showing prison or juvenile detention as just a detour on this journey. My mind map was not a simplistic drawing. It showed the 18 stories that could have been connected in an editorial or Internet strategy. If we're going to have a sophisticated strategy we should not just be focusing as prison as the place for "corrections". If you think of the growth of a child from birth to the beginning of a job/career by age 25, a few years in prison or a juvenile detention center could be looked upon as just a detour between birth and a career. The time before prison should be an opportunity for young people to "get it right the first chance. Most should not need the second chance President Bush calls for. If the country were investing more consistently, and in more places where poverty is the enemy, to make prevention, youth development, education, and career aspirations programs more available, we might not need to be talking about so many people in prison and returning to the streets with no skills and few employers waiting to hire them. While parents, teachers, social workers, mentors, etc. push kids to stay in school and reach their potential, some kids live in neighborhoods where there are too few people modeling positive aspirations and providing significant support. In these neighborhoods business needs to be more involved, using its people, dollars, jobs, youth apprentice and vocational education programs to influence choices kids make, starting as early as 3rd and 4th grade. Programs that try to change behaviors that have been learned over the first 15 to 20 years of life are doomed to failure, unless there is a significant investment by industry to create career paths for ex-offenders. It's far less expensive to do it right the first time. The map in the Tribune article shows that many neighborhoods on the west and south side of Chicago are dumping grounds for ex offenders. Statistics show that 2/3 of these will return to prison. If these are the role models for kids between age 3 and 10, what career choices do we expect these kids will make? Let me go back to my mind map. Here were a few other stories that I put on my mind map. These were not negative news. They were positive. On page 1 of the Metro section there was a story about teens who get up early in the morning to take public transportation from one end of the city to another, just to get to a good school. On page 2 of the Metro section were two stories telling about a kids video project and a youth with “empathy for the poor”. In the Tribune magazine insert there was a story about a youth program called Changing Worlds. And in the Sports sections two pages recognized scholar-athletes. However, nothing tied these stories together. 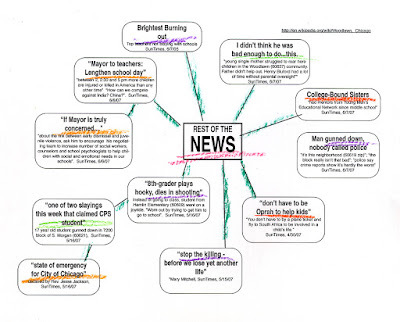 There was no mind map, or blueprint in the Tribune, or on its web site, suggesting that these are all part of a problem/solution mosaic that could be leading the 600,000 readers of the Sunday Tribune into a learning/reflection/innovation process that leads more Chicago area residents to take responsibility for making sure that every child in the Chicago region has a better chance to reach a job/career, even if he had a detour in jail. All of the stories in the Perspective section and in the Editorial page of today's paper were about Dad’s and Father’s Day. No effort was made to talk about how programs like the video project or Changing Worlds could be in every inner city neighborhood, providing an alternative to street life, and building aspirations that could compete with the careers modeled by ex offenders. There were even two stories in the Business section that could have tied in to this. One talked about how GM pays workers who are laid off, but still on the GM payroll. Another talked about the highest paid CEOs. There was no brainstorming in the commentary section suggesting that these CEOs could be using some of their huge income to support charities that mentor kids to careers, or ex cons to jobs. Neither suggested a strategy on the part of the car company to engage non working employees as coaches or mentors to ex offenders or inner city youth. I think about these concepts all the time. I'm trying to get others to think about them too. I don't have an advertising budget. But as Sunday's Tribune illustrates, there were many stories that reminded me of the problem and showed me many solutions. However, this is not a simplistic process. We need people who will help us see eduction, violence, public health, incarceration, workforce development, etc. as part of a web of issues related to poverty and too many simplistic solutions. 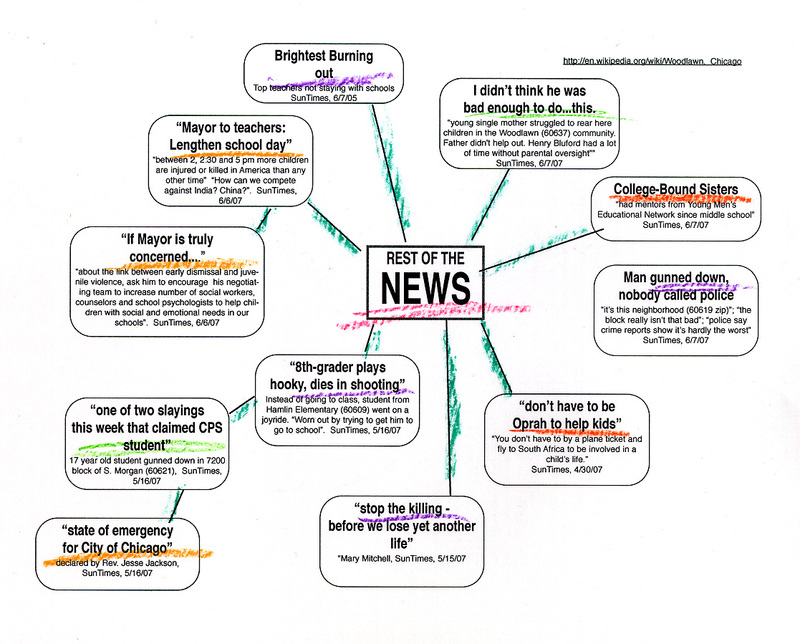 I encourage you to take next Sunday's paper and create a similar mind map. The stories will be different, but the problems will probably be the same, regardless of what city you are in. As you do this, think of ways your map and my map might connect, or how we might draw more people into this thinking. I think this would be a great project for kids in a high school or college service learning program or internship. It really shows how events are connected. I think it's a strategy that can get more people involved. If you can put your map on a web site or blog, let me know what your web site is. Thank you Gita Rao for sending me this article. I'm posting it here and will be sending email to all of those who care about how we help kids move through school and into careers. If we cannot change the funding process we can never change the outcomes. On page 3 or the Metro Section of the June 6, 2005 Chicago Tribune, an article reports on a new study published in the June issue of Pediatrics. The study concludes: Early violent death among delinquent and general-population youth affects racial/ethnic minorities disproportionately and should be addressed as are other health disparities. "Leaders in violence prevention say the study is a wakeup call to the needs of a wide variety of poor and minority youths. Delinquent African American males in the study had the highest mortality figures. The next highest rate was for Hispanic males." "This should be recognized and used as a red flag not to body-slam these (delinquent) kids, but to give them some services and some protective factors," said Carl Bell, a child psychiatrist and president of the Chicago Community Memorial Health Council. I agree. Now, how can we connect with the media, the health council and others to put this message on the front page instead of page 3 of the Metro section? 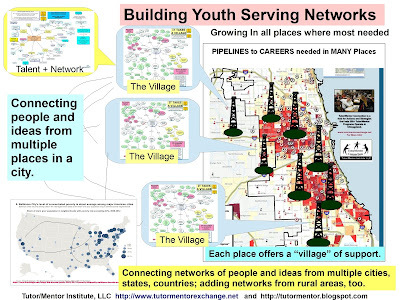 How can we build a strategy that connects news and research to advocacy and to web directories that show what agencies are working in inner city neighborhoods to prevent kids from entering the juvenile Justice system, or to provide meaningful paths out of the system and into jobs/careers? In a world where most people are focused on their own concerns, their own health issues, or the challenges of raising their own kids, how do we get people to become passionate about helping kids who don't look the same, have negative media images, and don't even live in the same neighborhood? In a world focused on war, terrorism, politics, how do we draw attention to the unequal opportunities of kids living in poverty? I believe the internet, blogging, web forums, etc. offer tools to connect those who care about these kids in a virtual forum that draws more consistent attention and resources to young people born in poverty. If you agree, join the Tutor/Mentor Connection in this effort. Jesus or Martin Luther King, Jr. As CEO: Think about it. A few years ago a supporter of the Tutor/Mentor Connection sent me the book, Jesus as CEO, written by Laurie Beth Jones. It took me a while to get around to reading the book, but when I did it became an inspiration that continues to support me in my work to this day. It shows how much impact a single person can have in this huge world. As I think about all the challenges facing kids living in poverty, I'm prompted to ask, "What would Jesus do if he were CEO of the business of helping every child born in poverty be in a job, career, by age 25?" I've also been inspired by Martin Luther King, Jr.'s I Have a Dream speech where he said, "I have a dream that my four children will one day live in a nation where they will not be judged by the color of their skin but by the content of their character. " You can read the entire speech here. What if Dr. King were the CEO of the business of making this dream a reality? Walk with me on a little mental model. Imagine you are in the first planning meeting with Jesus or Dr. King and they are introducing their vision and strategy. What would they say that inspired you to work to accomplish the goals they outlined? How would they have presented this information? Two thousand years ago tools like power point, animation, electronic white board and visual brainstorming were not available. I don't think they were even available 50 years ago. Yet today we have many technologies that support business planning, brainstorming and visioning. I've listed a few below. So, imagine that Jesus and Dr. King have web sites, and have access to power point, animation, auto cad, etc. Can you imagine how they would have presented their vision using these tools? What types of graphics would have been used to convey Dr. King's vision? How would Jesus have communicated a 2000 year timeline and expansion strategy? If you can imagine what these presentations might have included, can you put your mental map on paper, and on a web site? Do you know of people who have already done this? If you can imagine how Jesus or Dr. King's presentation would have looked like, can you create a similar business plan that "leaves no child behind" and achieves Dr. King's vision? Maybe if we create such a plan our public leaders might adopt it and lead it. 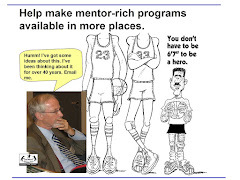 The goal of the Tutor/Mentor Connection is to find people who are using mental modeling, backward mapping, virtual brainstorming and other innovation tools to create a plan that engages business, philanthropy, schools, hospitals, community based organizations and public leaders in a hundred-year campaign aimed at helping kids born in poverty be starting jobs/careers by age 25. We want to host this process on our web sites and encourage others to do the same. We want to link to other web sites where this process is already being hosted in churches, alumni groups, universities, law firms, engineering associations, fraternities and sororities all over the world. In such a network we are all constantly learning from each other and some of us are constantly working together to provide resources that others can use at low or no costs to support this action plan in every neighborhood where kids need help to get to jobs and careers. That's our dream. In the Tutor/Mentor Institute web site you can see how we describe this using the tools we have available to us. Below are tools that I've seen on the Internet which I wish were available to the Tutor/Mentor Connection. If you are already building such a model and have it on your web site, please let me know so I can add a link from my web site to your planning model. I'm sure that Jesus and Dr. King would have had to include a section on their plan for evangelization and advertising. If no one looked at the plan, how could they expect to make it a reality? They also would have been benchmarking competitors and innovating constant improvement based on what they were learning. By putting your vision on your web site you enable others to compare what they are doing to what you are doing and learn ways they can constantly improve what they do to help kids. While most businesses keep their innovations secret, we want to share our innovations in ways that others can duplicate them. By linking our web sites we increase the number of people who look at our vision and our plan, without increasing the cost of attracting these visitors to our web sites. We also increase the sharing of good ideas and the number of people who work together to increase the flow of resources to support innovation and process improvement. I'm sure all of these concepts would have been in the strategies outlined by Dr. King and Jesus. Imagine what we could learn from them if we could find their plans some place on the Internet. You can find links to the web sites I've referred to in this message and to many others at Learning and Management Tools section of the Tutor/Mentor Connection to find more examples of knowledge management, decision support, innovation and creativity.